After an uneventful walk the other day, I was returning home when I spotted this 'leaf'. However, last time I checked, leaves hang from trees and don't hang from grass. Ohhhhh Silly me. That's not a leaf! 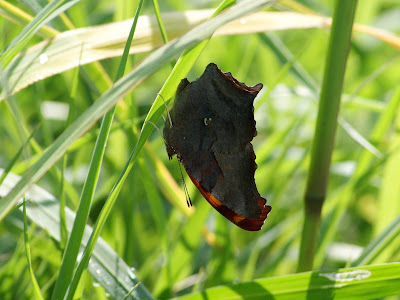 It's a Question Mark butterfly. it's gonna get a headache! Good morning, Misty. Great butterfly captures. This is one I've never seen (except for in my field guides). Thanks for posting before your coffee...I wanted to get my link up before I head out for a morning of errands... and to get myself not just a cup of coffee, but a coffee POT! Gorgeous butterfly - well spotted! Good morning, Misty (before your coffee??!!!). Wonderful shot! I'll remember to try not to step on leaves! How wonderful they are! Great post dear friend and thanks for this Camera Critters again! Oh wow! You have a good eye. It's a happy thing you spotted this beauty. Love the color and spots. It's quite lovely nice shot. Fascinating find. I've never seen such a thing .... but maybe I was just assuming they were leaves! So pretty and it did look a leaf at first. You got a great shot. At first I couldn't tell what it was either!! 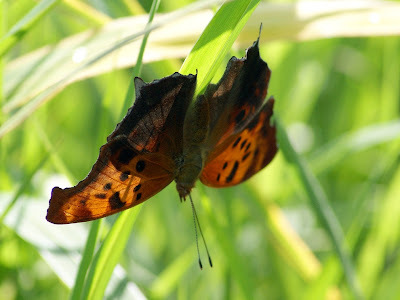 I love butterflies and they are hard to capture in a good shot. Thanks so much for dropping by and visiting and leaving such a wonderful comment!! These are awesome photos. Never heard of a question mark butterfly before. what a gorgeous butterfly, love her spread eagle post. These are two that I have yet to see. As a matter of fact, inspite of all the foods available here, I have yet to see a butterfly this summer. wonderful markings. great capture. congrats on the POTD mention. Beautiful! Congrats on the Post of the Day mention! That is a wonderful little butterfly!! Love him! Never have seen one before! Fantastic shots of the beautiful butterfly. Great thinking from your camera's lens. Rare picture indeed. Congrtulations for nomination to POTD. Sounds like a very eventful walk afterall. I can't remember the last time I saw a butterfly thanks for sharing. Anyone Find My Misplaced My Energy? Is There a Pearl in This Oyster?